There are certain “hot button” issues regarding Walt Disney World that are certain to get the attention of its fans. Recently, I visited one of them when we reviewed parade viewing etiquette. Well, it’s on to the next topic. It’s a topic that’s right up there with the resort mug debate. It seems many of the controversial topics regarding Walt Disney World have one thing in common - a policy with wording that is open for interpretation. The same is true when it comes to pool hopping. I’ve reviewed the policy and have spoken with several Assistant Managers and Cast Members at the various resorts regarding the pool hopping policy. What I’ve concluded is it seems we all have a general understanding of the policy; however when we read it or discuss it with a Disney Cast Member the wording can allow us to interpret something different. Continue through the page break and let’s “dive” into the various aspects of Disney’s pool hopping policy. SPLASH!!! Scenarios Abound – Who could possibly have all the answers? Let me first get something off my chest. I’m not defending anyone who knowingly breaks the pool hopping policy at Walt Disney World. Most of the policy is pretty clear and there are some common sense elements to it that guests should easily understand. Before we review the policy let’s discuss why the pool hopping topic is so controversial. 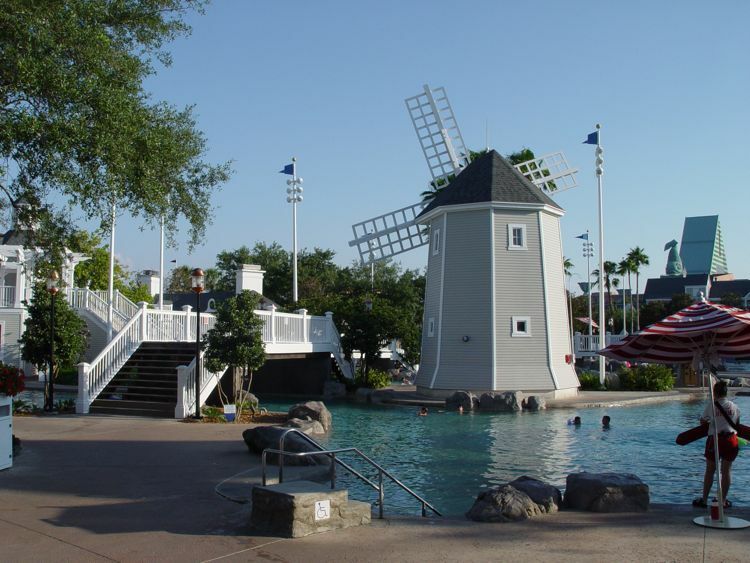 With so many resort hotels at Walt Disney World ranging from value resorts to deluxe resorts you would expect the pools to match the resort’s caliber. Some of the Disney resort pools are on par with resort pools on the Las Vegas strip. They are well-themed, large, and in some cases extravagant. Knowing this, let’s take a look at a specific example of a gray area within the pool hopping policy. Let’s say two families travel together to Disney World. One family stays at Pop Century and the other family stays at the Beach Club Resort. Both families wish to spend time together at the pool. Through the natural course of the decision-making process the family at the Beach Club Resort invites the other family at Pop Century to join them at the Storm-Along Bay pool complex. The family at Pop throws on their swim wear, packs up their pool bag, and heads to the Beach Club to meet up with the other family. So, are guests from another resort allowed to pool hop if invited by another family? We’ll discuss that shortly, but for now just know that there are pool hopping scenarios that aren’t clearly defined. This is where Disney fans strike a chord of discourse and the intense debate begins. The debate can go back and forth with both sides justifying their arguments. Basically, there are enough scenarios and different points of view to create multiple opinions. It’s difficult to draft a black and white pool hopping policy when so many scenarios are in play. With the busy Spring Break and summer months fast-approaching examining Disney’s pool hopping policy seems like a good idea. You know it’s going to be hot and humid in Orlando and everyone will be looking to cool off, especially in the afternoon hours when the heat reaches its peak. When looking at Disney’s pool hopping policy there are two categories. The first is for DVC members and the second is for general guests. Because both are very different let’s take a look at each separately. Congratulations! You’ve taken the plunge and purchased an interest in the Disney Vacation Club. When you made the commitment to join DVC you were also granted certain perks and privileges that come with your membership. One of them is the pool hopping privilege. 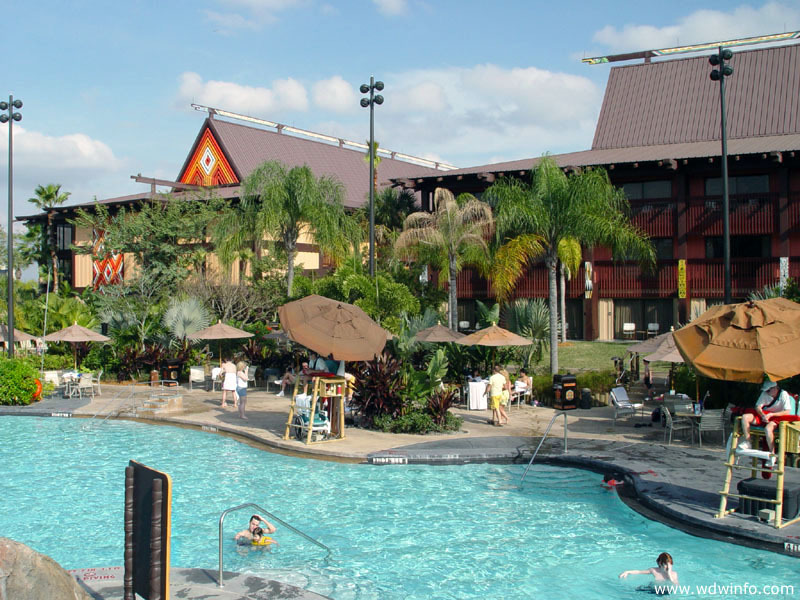 DVC members staying on points at a DVC resort can pool hop to most Disney World resort pools with a few exceptions - Disney’s Yacht & Beach Club, Animal Kingdom Villas, and Bay Lake Tower. Additionally, there are certain blackout dates DVC members cannot pool hop because of high crowds and resort occupancy. Be sure to check the DVC member website for specific dates as they change year to year. This policy seems pretty clear, but again there are scenarios where DVC members could make certain interpretations or decisions based on the DVC policy. What if the family staying on DVC points invites a couple of guests not staying on points to pool hop with them? They head over to a crowded Polynesian Volcano pool where the non-DVC guests grab a couple of lounge chairs and enjoy all the amenities that pool has to offer. They are guests of the DVC members staying on points. Is this appropriate? Some DVC members would say yes and some would say “absolutely not”. The DVC pool hopping policy does mention guests staying inside the room or villa can pool hop, but there really isn’t any language about guests. This problem could potentially be solved if the family staying on points asks a lifeguard or Cast Member for permission when they enter the pool area. Depending on the crowds and the time of year they may grant or deny you permission. If you are denied permission just remember the Cast Members are only trying to control crowds and make it safe and enjoyable for the legitimate resort guests. 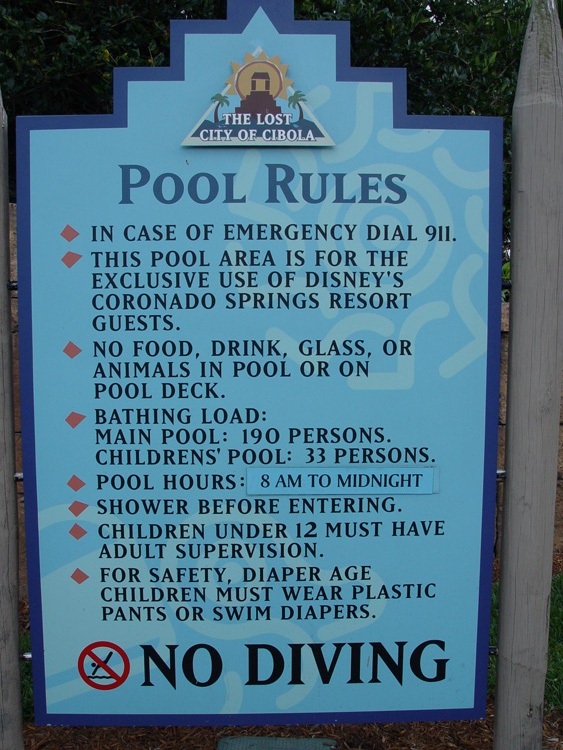 Disney’s resort pool hopping policy is very clear regarding general guests. You may use the pool(s) at the specific resort where you are registered. You may not hop to another pool at another resort and use their pool facilities. Most pools have signs advertising this information to guests. I’ve heard some pretty amazing stories of guests abusing the resort pool policy. One guest paid for a night at the Beach Club Resort and hosted their child’s birthday party at the Storm-A-Long Bay swimming pool. The family lived in the Orlando area and invited 8 of their child’s closest friends to the pool party. How many guests can fit inside a room at the Beach Club? What if the family paid for a suite that can hold up to 6 guests? Should this be allowed? Also, is calling their visit to the pool a birthday party legitimate? Again, these scenarios need to be considered, but ultimately the pool hopping policy comes down to a few things, honesty, integrity, and common-sense practices by guests. 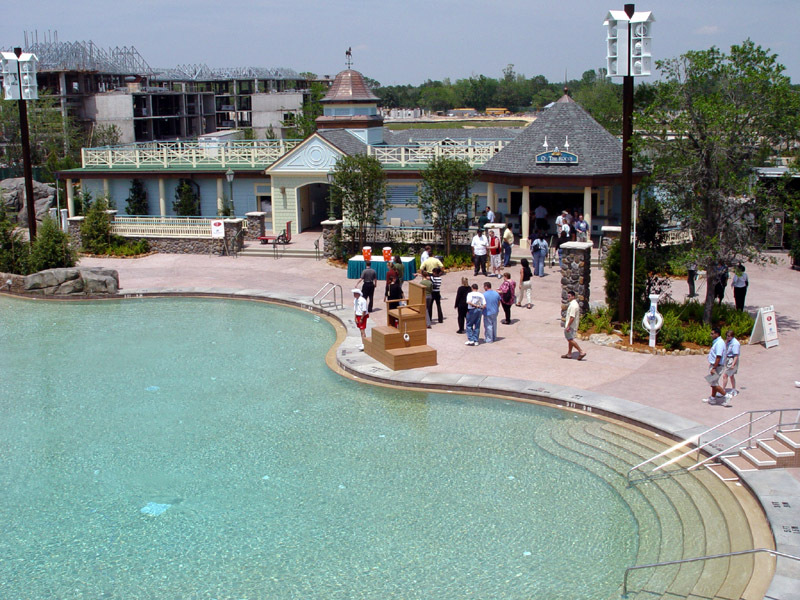 From time to time pools at the various Disney World resorts close for refurbishment. If this happens you’ll probably receive a letter in the mail prior to your vacation from the resort announcing this closure. Included in the letter will be instructions with another resort pool option. For example, if the pool at the Polynesian is closed, guests of that resort may use the pool facilities at the Grand Floridian. Although this doesn’t happen a lot it does occur from time to time. Don’t be surprised, especially during off-peak times, if you receive notice of a pool refurbishment affecting your vacation. 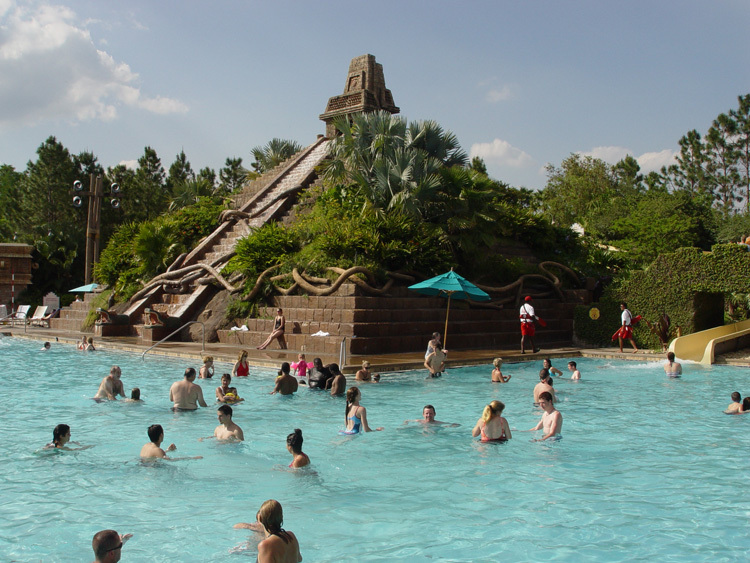 Bottom line – Disney’s enforcement of the pool hopping policy is inconsistent at best. Every so often you may be asked by a Life Guard to show your room key to verify you are allowed to be at that specific pool. As a DVC member myself I’ve only been asked to show my room key at the Polynesian Resort’s Volcano Pool and at Storm-A-Long Bay at the Yacht & Beach Club Resort. I’ve never been asked to show my room key at any other resort pool. Some resort pools do have gated access that requires your room key to gain entry. Personally, I’ve seen guests get in without swiping their room key at the gate. They sort of walked-in behind someone with legitimate room key access. Since those pools require a room key to get in lifeguards are not as likely to check your room key. They assume you had to gain access with your room key before entering the pool. This is another flaw in the system and another way for guests to sneak into a pool where they don’t belong. Disney’s enforcement of the pool hopping policy needs to be more consistent. There really needs to be a check-point at every deluxe resort pool. When guests enter the pool area a lifeguard or Disney Cast Member needs to check your room key to validate you are allowed to be there. As far as allowing invited guests not staying at your resort into the pool area it has been said if you ask permission to the lifeguards or Cast Members prior to entering the pool you may be allowed to bring them with you. This is usually a situation where it depends on which lifeguard or Cast Member you ask on which day. They may allow you to do it or they may say no. With so many scenarios and so many unanswered questions in Disney’s pool hopping policy it’s easy to understand why there continues to be a strong debate about it. For some guests, they can understand it relatively easily while other guests misinterpret the policy and unknowingly use it to their advantage. 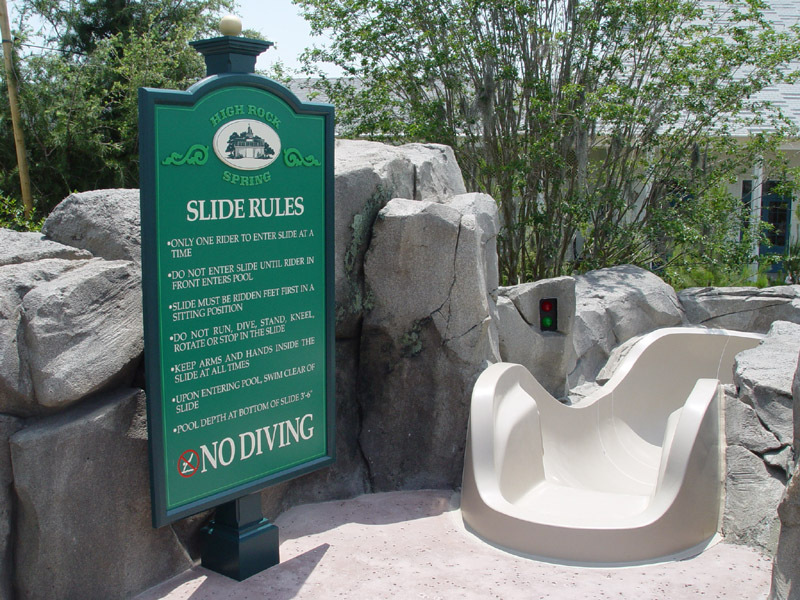 For those guests who know the policy and take advantage of possible loopholes you may cause Disney to take steps in the future that could affect legitimate pool guests’ enjoyment. Pleading ignorance of the policy if you get caught may clear you of any wrong-doing, but just remember the possible affect you could have on other guests who couldn’t find lounge chairs for their family, or had to wait in an exceptionally long line at the pool slide. Do you have a pool hopping story to share? Have you witnessed pool hopping abuse by other guests? We want to hear your story. It’s important for us to know what loopholes illegitimate guests are using to pool hop. It will better help us to report abuse during our future Disney World vacations. It’s up to legitimate pool guests to report possible abuse to help control the problem of improper pool hopping. For more information about the pool hopping policy at Walt Disney World check out this great thread on Disboards.com that discusses and answers many questions about it. The popularity of deluxe and even moderate resort pools at Walt Disney World is creating very high crowd levels around the pool facilities. If illegitimate guests are using these pools it only puts a further strain on lounge chair access, slide lines, and other water features, especially during the busiest weeks of the year at Disney World. I’ll admit Disney lifeguards and Cast Members have been checking room key cards more frequently as of late at the pools to try and control the problem. So, if you are considering pool hopping illegally just remember you may be asked to show your room key. If you didn’t know the rules and you are asked to leave then it’s a lesson learned. If you did know the rules and you’re asked to leave the pool area don’t let the gate hit you on the way out.